in this gimmicky netflix original, the lead singer (corey feldman) of a rock band named johnny splatter shots himself keanu-devil’s advocate/edward norton-fight club style and have acquaintances show up at his mansion to hear his will. within 5 minutes you can probably guess where it is heading. if you don’t, think 13 ghosts(both versions), the haunting (both versions), or agatha christie with a bit of saw. 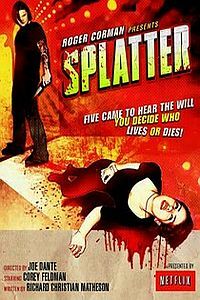 what drew me to splatter was the producer roger corman and its director joe dante. also, it’s 29 minutes long, and available on netflix instant stream. apparently, it was done in 3 10-minutes webisodes in 2009, with netflixers voting what happens next. watching it a year later as a whole, it is quite disappointing, considering the previous works(gremlins 1 & 2, the ‘burbs, small soldiers, matinee) of joe dante. other than the let’s see how/why/in what order each character dies, there’s really not much to it. not even the usual dante dark humor. there’s also somewhat of a punchline at the end that would fit right in in any versions of any twilight zone/outer limits episode.